We just returned late last night from Florida, where we spent Thanksgiving..
~ ~ and celebrated my mom’s 88th Birthday. This morning I hit the ground running and resumed the Christmas decorating. No one room is entirely done, so I shall show you snipits of the sunroom Christmas decor. I purchased a vintage galvanized pail at an estate sale..
~ ~ and thought it would be a great container for the sunroom tree. 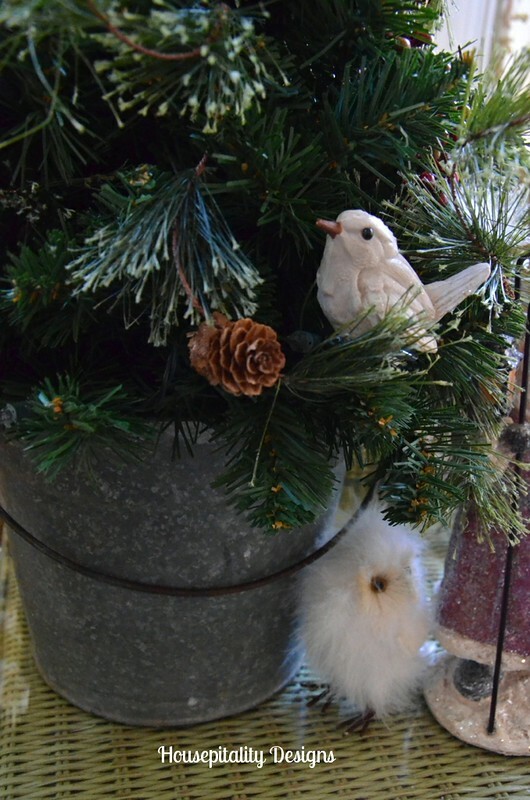 This particular small faux tree has a great variety of evergreen branches..
~ ~ and I added a a pine cone ever green garland along with a grapevine with red berries. 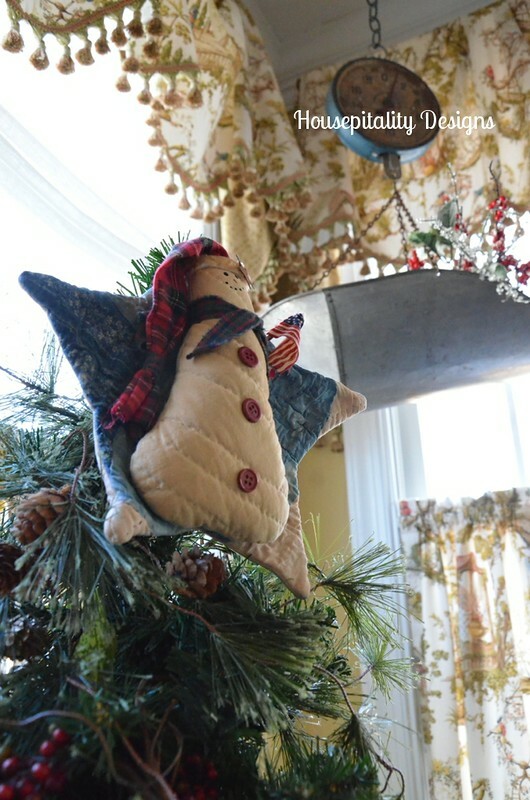 I topped the tree with a “Santa Star” made from a vintage quilt. Now the hanging scale is looking pretty festive. 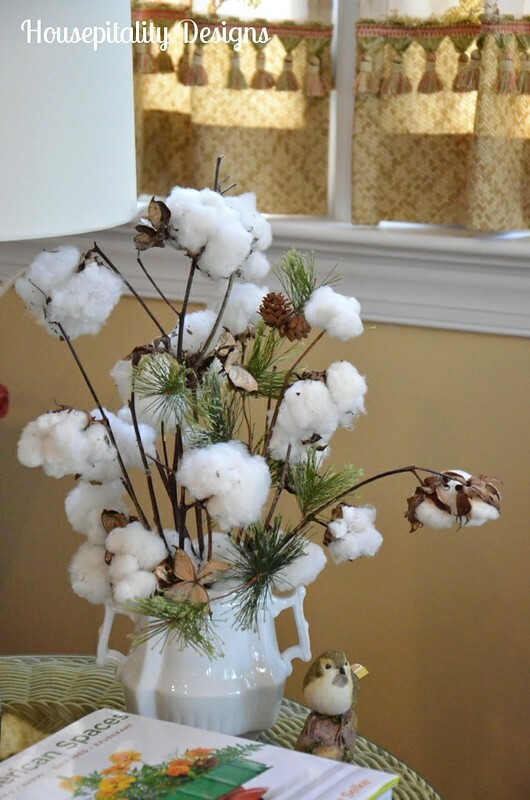 Added some faux evergreen to the cotton arrangement.. Still working on this room and hope to present the entire room soon. I seem to be jumping from room to room ~ ~ A Bit of Christmas decorating ADD..
And here is my mom being surprised at her birthday party..
~ ~ she thought she was just meeting us at the restaurant for dinner. 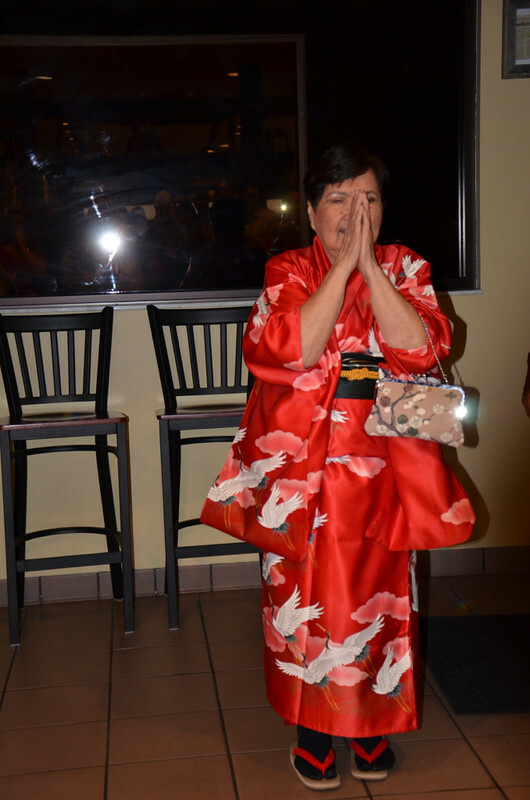 She wondered why we wanted her to dress up in her kimono. How wonderful does she look for “88 years young” !!! I will be working round the clock on decorating for Christmas..
~ ~ as I will be joining those wonderful ladies for a “Deck the Halls” Christmas Tour this week!! Your mom is adorable! Wow, she’s a young 88! You have good genes! I hope she had a fabulous day! I know it was very special with you there! 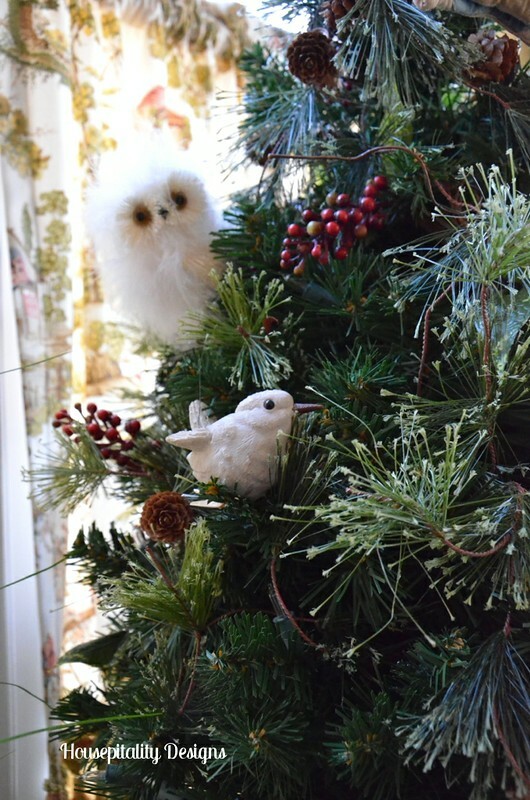 Your tree is so cute! 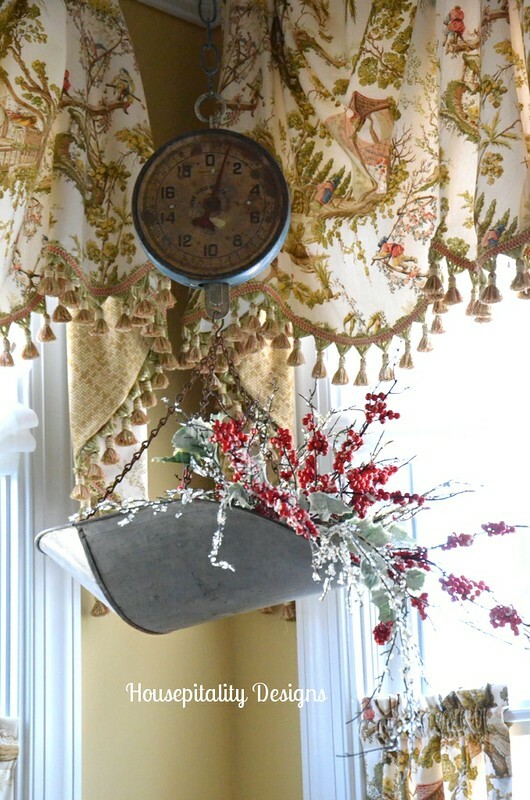 The topper and pail are fabulous!I love the country influence! I can’t wait to see more! 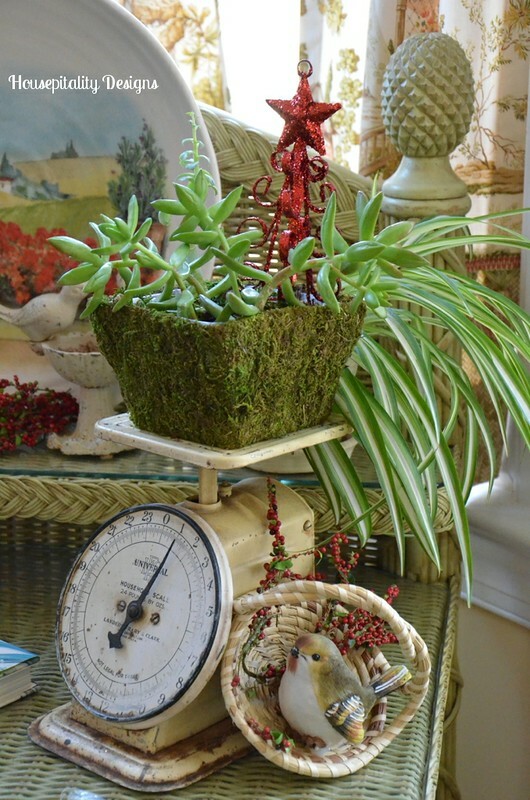 Love your festive touches in the sunroom and your mom looks spectacular!! Your Mom looks lovely! 88! She looks great! 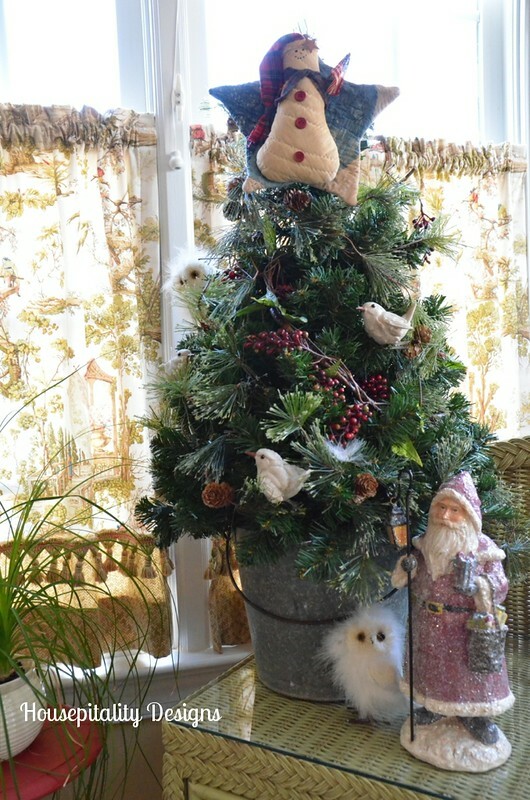 I like your galvanized bucket for your tree – wish I had thought of that. All your decorations look lovely. Happy Holidays! Shirley, your mom is gorgeous!! 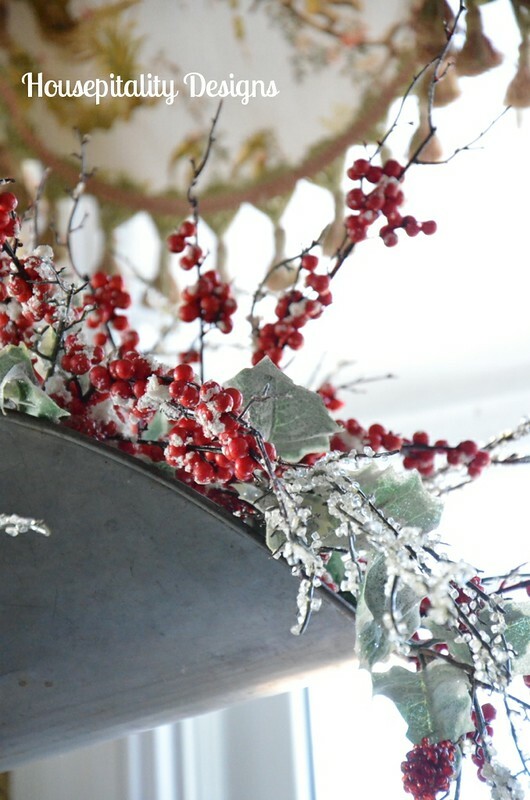 Always love seeing your sunroom, the galvanized goodies look so wonderful all fluffed for Christmas! Your mom looks FABULOUS Shirley!! 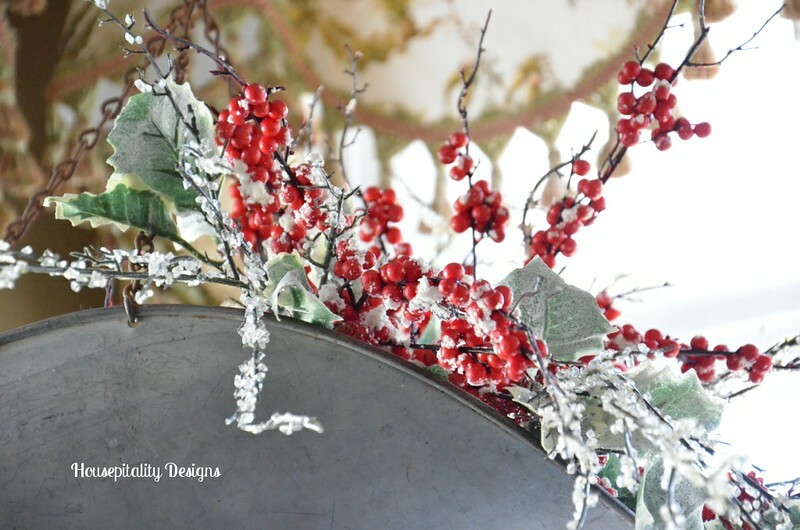 Love your country Christmas touches…love the tree and the berry picks on your scale! Oh your mom is so cute and wow she looks so great for 88 years old. Too sweet. I love your country Christmas decor in the sun room. Those icy berries in the scale are so pretty. Happy Birthday to your mom. Your mom looks amazing. I’m sure she had a wonderful birthday. We surprised my mom on her 90th. We should probably be more careful about that as they get up in years LOL. The sunroom is really coming together, I lov this tree and in the bucket it looks so cool!! Love your sunroom and all of your Christmas decorating in the sunroom. Cannot wait to see the remainder of your home…Just started my decorating today. The house looks a mess right now. Will take me a while to get it all done. Your mom looks wonderful. One would not believe that she is 88 yrs. old. Love your bucket with the tree ! Love your scales ! Love it all 🙂 Happy Birthday to your Mom ! How wonderful ! SheilaG @ Plum Doodles’s recent post…It’s Giveaway Time Again- How About a $600 Visa Gift Card?! Your Mom is beaming and looks beautiful! I know you all had a wonderful time. 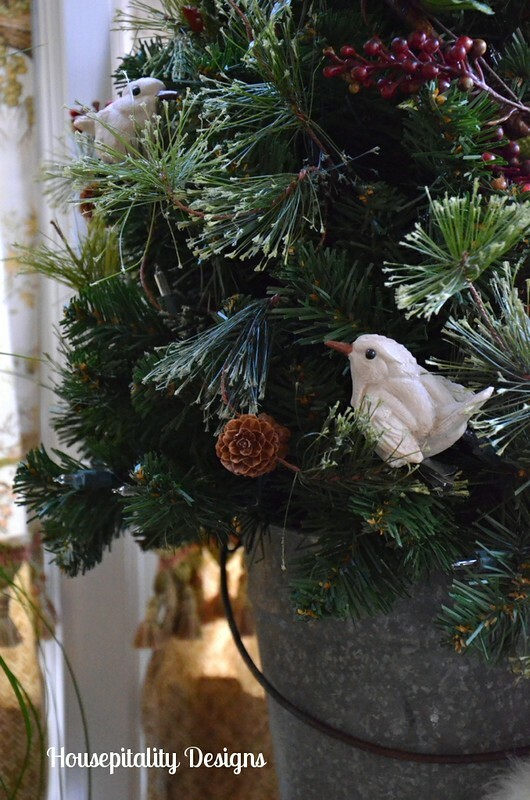 And, I love the country Christmas feel in your sunroom! I’d love to find a bucket to put a tree in like you did … looks awesome, and, I love your Santa … look forward to seeing more! BECCA’s recent post…In the Bloglight at Hometalk! Awww..what a beautiful lady your Mom is! Your sunroom looks gorgeous Shirley. I love that scale! And your sunroom looks gorgeous-I love the mix of some rustic and some ‘glam’. Happy Birthday to your sweet mom. She certainly does not look 88 – she looks terrific! Don’t feel bad – I have boxes all over the house only a few more to go – went a little crazy this year. Have fun creating and looking forward to your posts. Happy birthday to sweet mom.I love that she was surprised and that you were there. What a wonderful celebration for you and your mom! As for decorating, you are so far ahead of me. I’m thinking I might just enjoy what everyone else does this year! 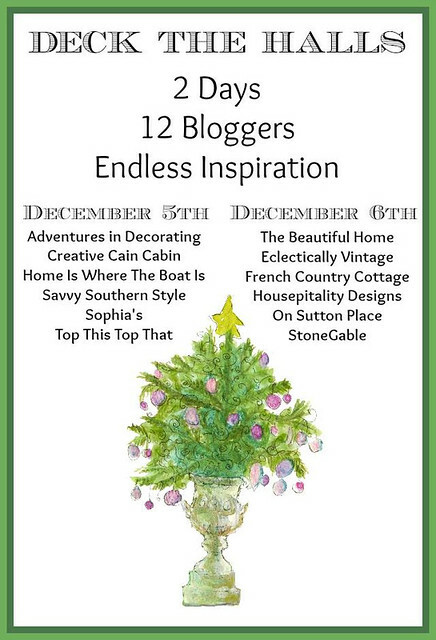 Heidi @ decor & more’s recent post…Sponsor Spot Light: Shop Small Saturday! Oh, Shirley, your mom looks beautiful! How sweet to give her such a lovely surprise! The sunroom looks great. I hope to get back home, by the end of next week, and get some holiday cheer going. 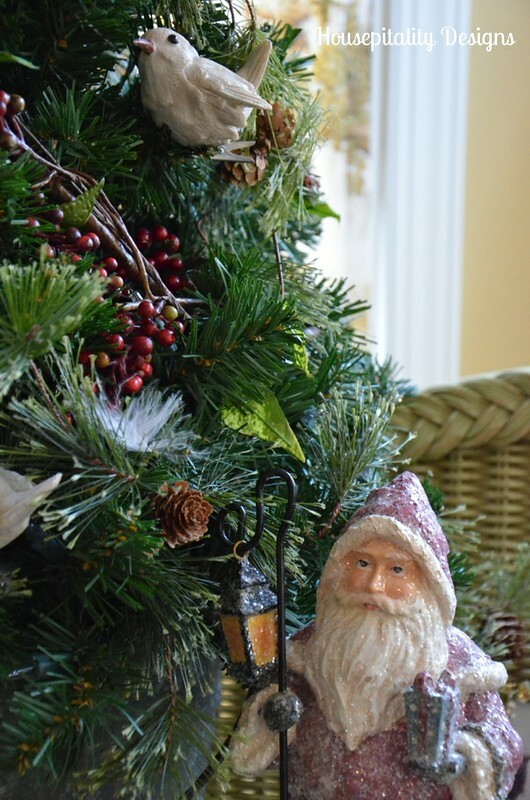 Pinky at Designs by Pinky’s recent post…SANTA has arrived at our house!!!! Ahh Happy Birthday to your mom! Loving the Christmas decorations. I just got back Sunday night late and trying to get everything pulled out and decorated. Hopefully we will be getting a tree tonight and get that started! Enjoy this season. I love your scales, and the way you decorated them. 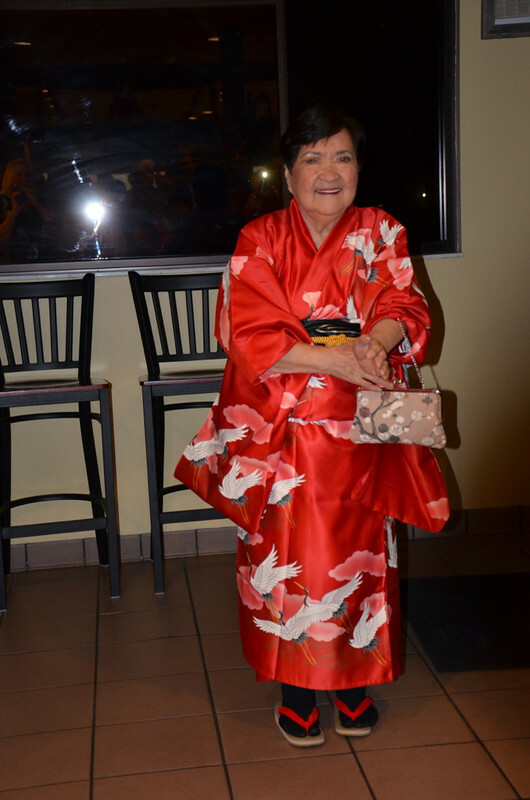 Oh Shirley, your mom couldn’t be any cuter!! How wonderful that you could be there to celebrate with her, I can only imagine how special she must have felt! I love your scales with the red berries, looking forward to the tour!